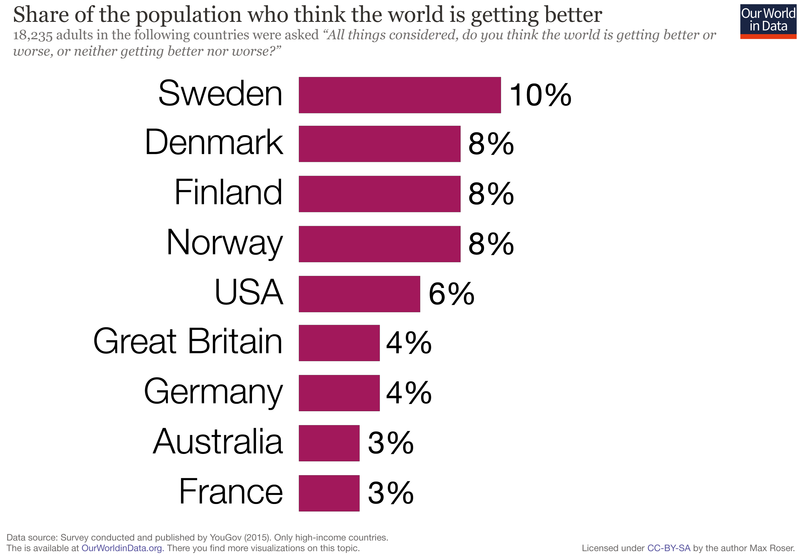 Data Shows The World Is Improving, So Why Do So Many People Think It’s Trash? It’s no surprise then that everyone wants to talk about how awful the planet is, how we’re headed towards extinction, how the invisible monsters from Bird Box are going to visit earth and decide to skip right over us because we’re doing a fine job destroying ourselves without them. But while connecting via our shared sense of societal malaise certainly makes sense (and has become an intrinsic part of social media’s right and left wing factions, Twitter in particular), it’s worth asking: Is everything really so awful? Is there any case to be made for optimism? If you have any faith in statistics, the answer to those questions are “no” and “yes.” Speaking globally, by virtually every metric available, the overall experience of humans living on earth is steadily progressing. Extreme poverty is plummeting; so is infant mortality. Secondary education rates are at their highest ever; illiteracy has hit an all-time low. Fewer people starve; more people live long lives. The number of wars and dictators are trending downward; the number of people living under democracy is headed up. And yet… few people seem to think life is getting better. Roughly 6% of Americans take that view and we’re in the middle of the pack worldwide. Which begs a few major questions: Why do so many believe that everything trash? If it’s not trash, why do we insist on holding that position? And, most importantly, is there room for optimism in our current dialogue? The idea that things are better than we’re willing to admit has been posited before, most notably by Harvard Professor Steven Pinker, in his books Enlightenment Now and Better Angels of Our Nature and a very viral TED Talk. Pinker’s basic thesis is an extrapolation and expansion of the data points listed above. His work revolves around the idea that things are, in fact, less trash than they were 30 years ago. As a public figure, he’s optimistic, smiling, and has supreme faith in the universe’s slow arc toward justice. Bob Ross for intellectuals. Like so many other people making the case for our collective optimism, he’s also white, financially secure, and blessed with a superb pension. Pinker seems to vaguely understand all of this. In fact, he says in his TED talk, “Progress does not mean that everything becomes better for everyone, everywhere, all the time.” But he wants us to take the 1000 yard view and see the statistically less awful forest for the historically atrocious trees. It’s a tall order for people staggering under the weight of loans or institutional bigotry. How can you ask those concerned with justice to believe that things are getting better just months after the Kavanaugh hearings? Or Trayvon Martin, Alton Sterling, and Philando Castile? Or what about wage stagnation? Even the lowest unemployment rate in 50 years is unable to charm us when we have to hustle 60 hours a week to cover rent. On top of all this, the internet in general and social media in specific have made gathering bad news tremendously easy. And while our increasing access to information could deliver “good news” to our fingertips too, it typically doesn’t (Upworthy is the now-mostly-defunct outlier here).